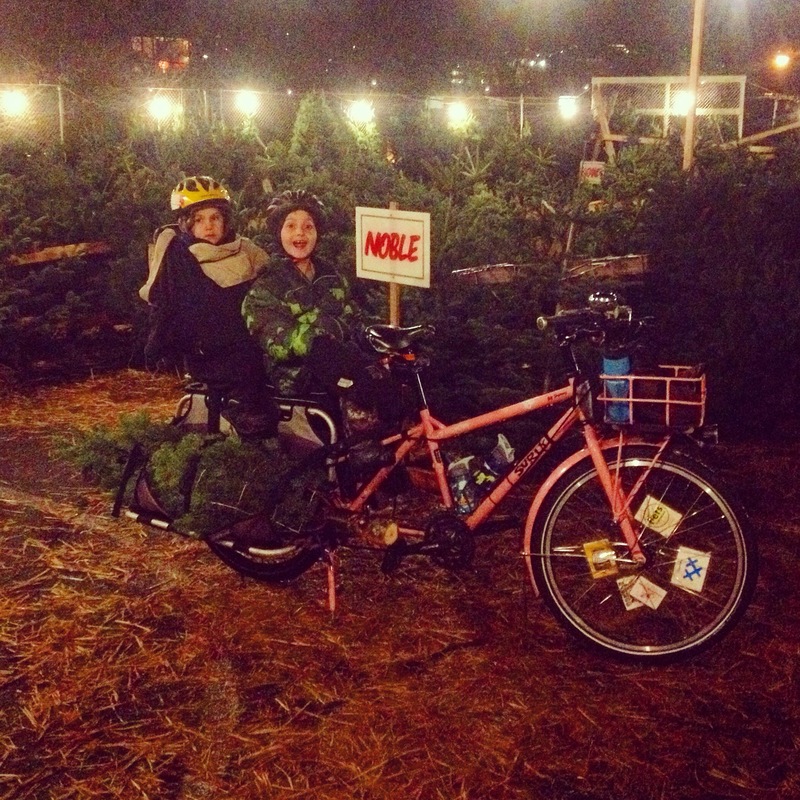 Remember a couple weeks ago when family biking was trending big time? Well, I felt decidedly untrendy for our latest trip to the orthodontist. We bike-bus-bus-bike to Issaquah fairly often and the bus always provides new and interesting experiences, but today was just bizarre. While exiting our first of four buses (four round trip, that is) the bus driver said to me, “So I take it you’re the nanny?” He caught me off guard, reminiscent of when I was mistaken for homeless and I responded with a quick, “Uh, no, those are my kids.” I wish I’d asked him why he’d made that assumption, but we were in the middle of hopping off a crowded bus, you know. I can only guess it was because we were traveling by bike rather than in my mom-mobile minivan. Right?? 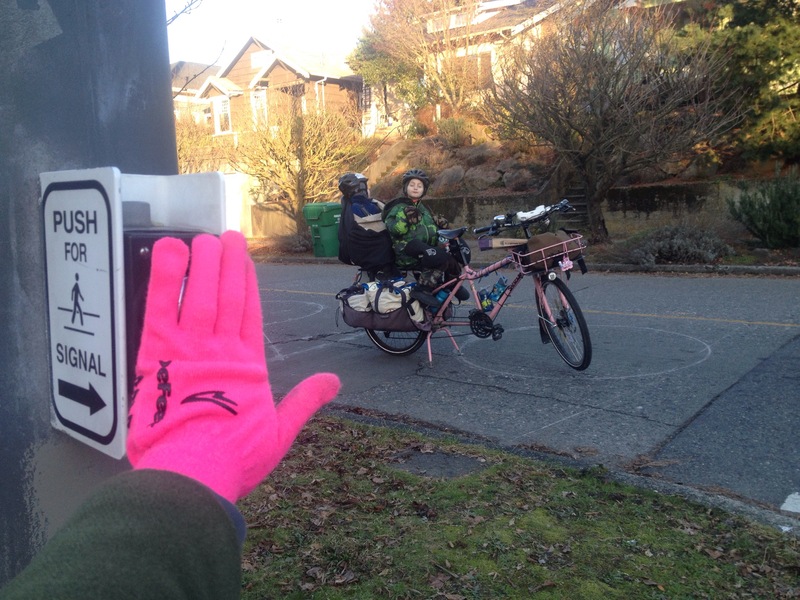 Even though family biking didn’t feel like an “in” thing today, infrastructure that supports family biking sure did. 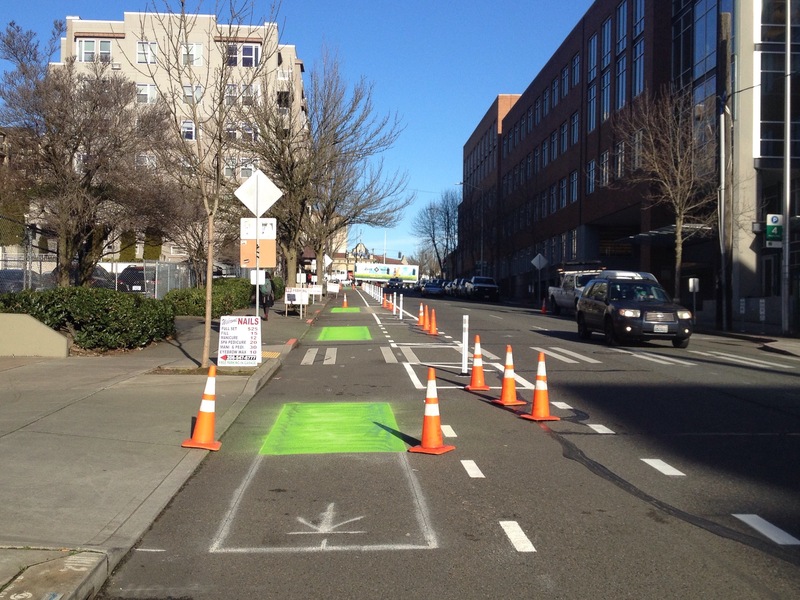 I saw the installation of a protected bike lane on Roosevelt Way. We ride a different part of Roosevelt Way quite a bit, but never down here–it’s just too dangerous. I have a friend who works in a building right here–with a view of the street from her desk–and I’ve promised her I’ll never bike down here; she sees crashes all the time. And new cargo toting fun today, too! 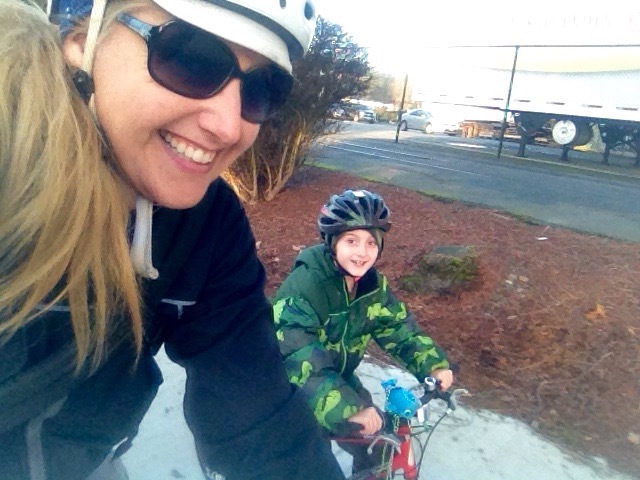 While I’ve carried the 16″ bike (and kid!) 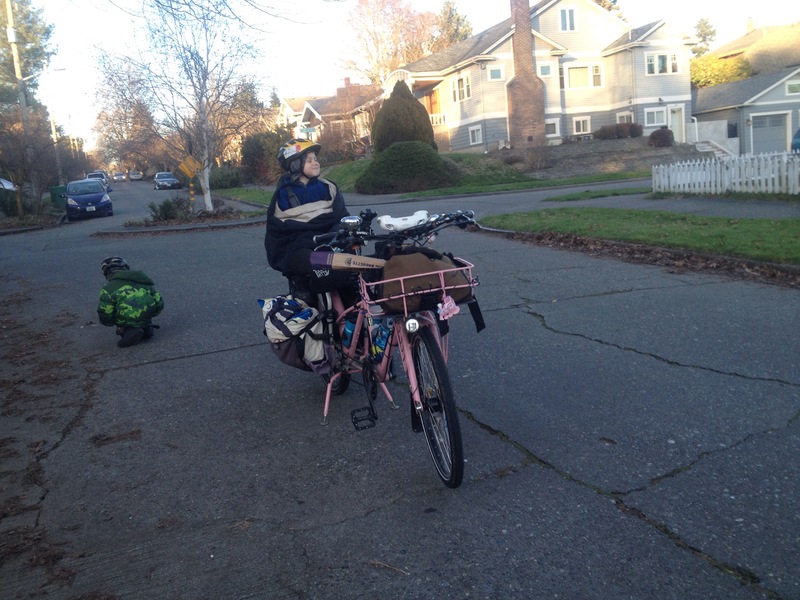 on the old mamabike, this was my first time carrying the 20″ kid bike (though no kid). 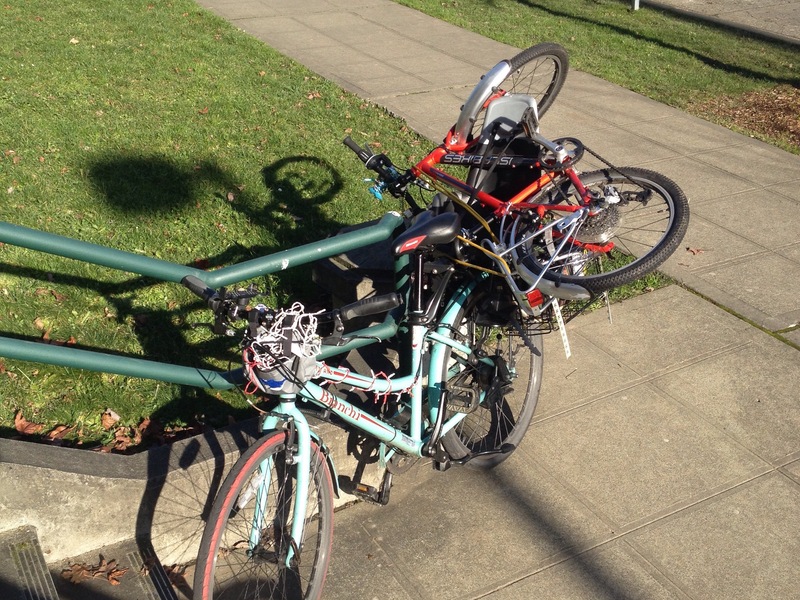 Granted it was born of laziness–I certainly didn’t want to walk the two bikes three and a half blocks to school pickup! The bike was very steady back there and could have easily traveled any distance like this. Good to know! “Do you think that because we’re on bikes and not in a minivan? We love biking! And we love taking our bikes on the bus. Thanks for being a Metro bus driver! I hope you’ll meet more family bikers, this is a great way to travel.” OK, maybe too saccharine. I need your help–please share in the comments what I should have said! 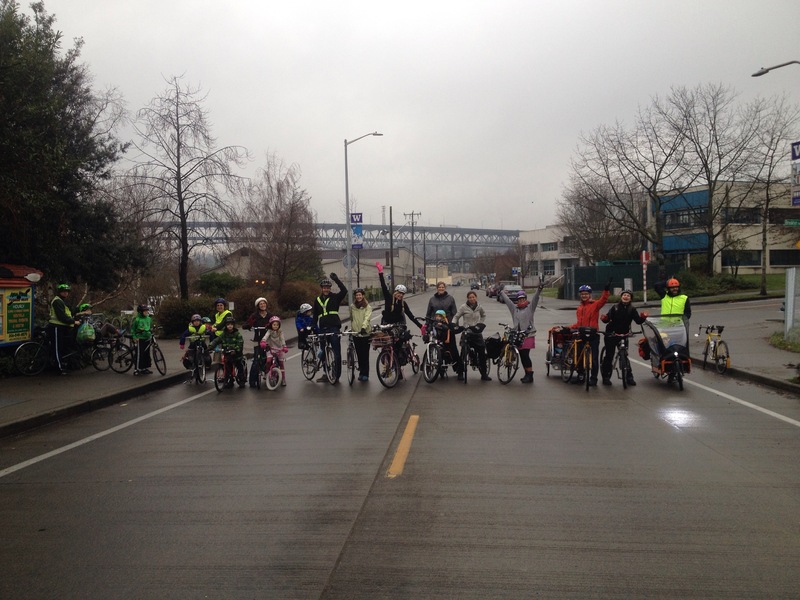 Last Kidical Mass was a big one! 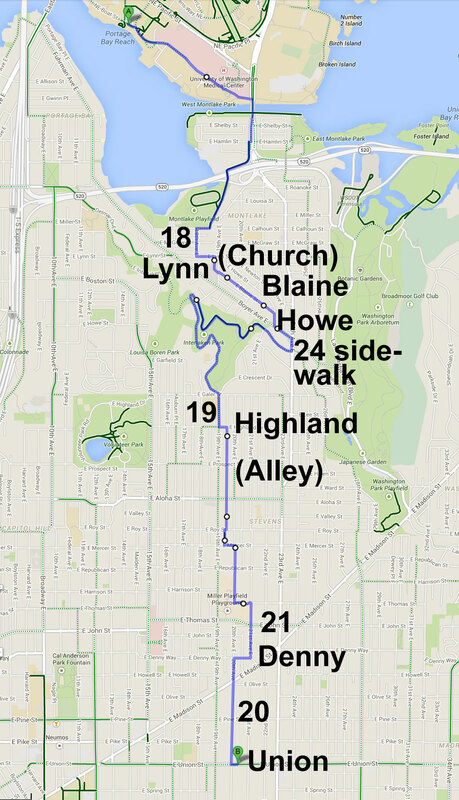 4.5 miles doesn’t look big in pixels, but U-District to Central District is hilly. Even when you take extreme care to use the flattest route possible…which we always do! Here’s a link to our route in Google maps and my smartphone lock screen map image with BIG easy-to-read streets in case you’d like to recreate our ride. After picking up a dad and baby shortly after heading out and picking up another dad and kid at Miller Playfield, we numbered 29 by the time we arrived to Chuck’s Central District Hop Shop. That’s a lot! Especially for this time of year, with such an early start time (9:30 a.m.), and such a long ride. The forecast looked OK, but it started drizzling during the ride and didn’t let up the rest of the day. 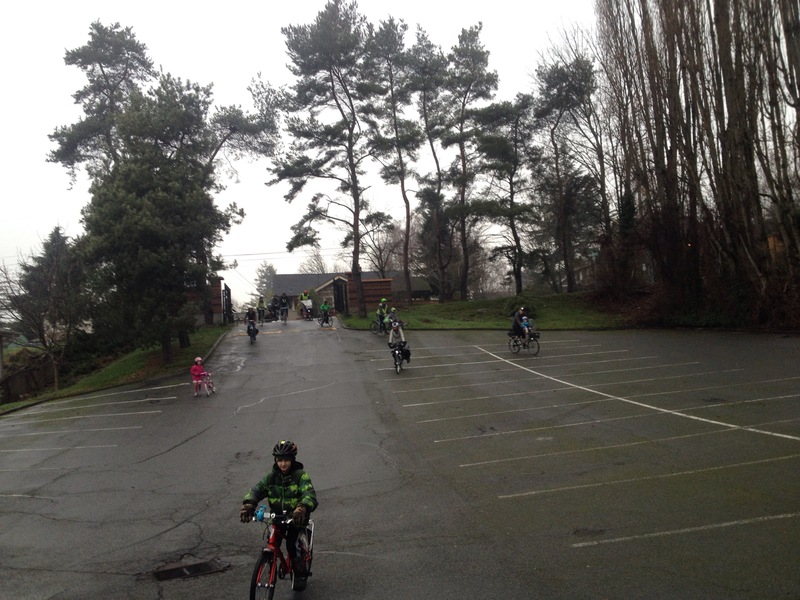 Here’s one of the rare steep downhills (most everything else was moderate or steep uphill) on our ride over, through the parking lot of the St. Demetrios Greek Orthodox Church in Montlake. Don’t worry, it was followed by a steep uphill to climb out the other side of the parking lot. I hear there are plans to complete the alley adjacent to the church, connecting 19th Ave East which will hopefully be less up-and-down. 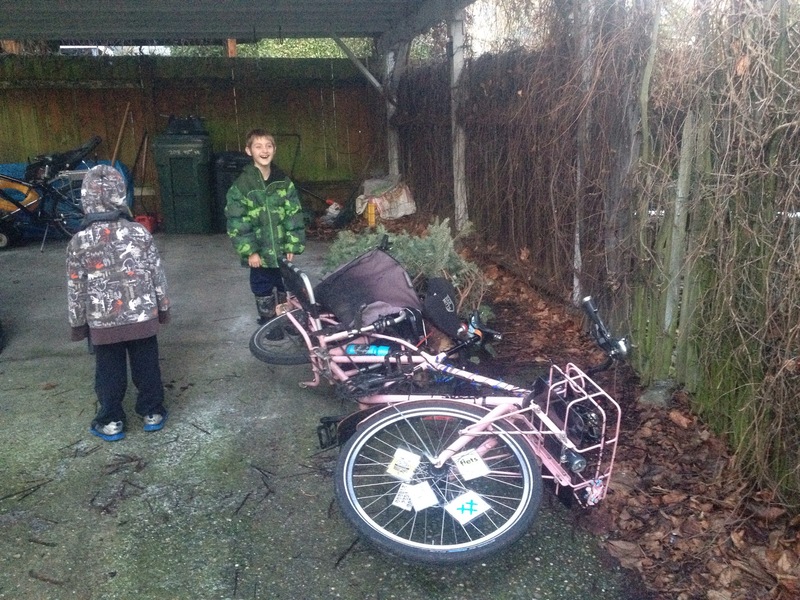 My seven-year old biked the entire ride, there and back, and my five-year old only wanted to hitch a ride twice–first for a few blocks and the second time he changed his mind and hopped off before the others had finished stripping extra layers and watering their passengers. This worked out well because he’s a beast up through Interlaken Park and just like during last April’s Silly Hilly ride, he charged ahead while I hung back with his big brother. I think once my seven-year old gets proficient at using the gears on his Islabikes Beinn 20 Large, he’ll be much faster, but right now, the single-speed CNOC 16 is impossible to ride slow uphill. Fortunately, a couple other Cascade Bicycle Club ride leaders had come along for fun, so I swapped spots and brought up the rear for the hard part. 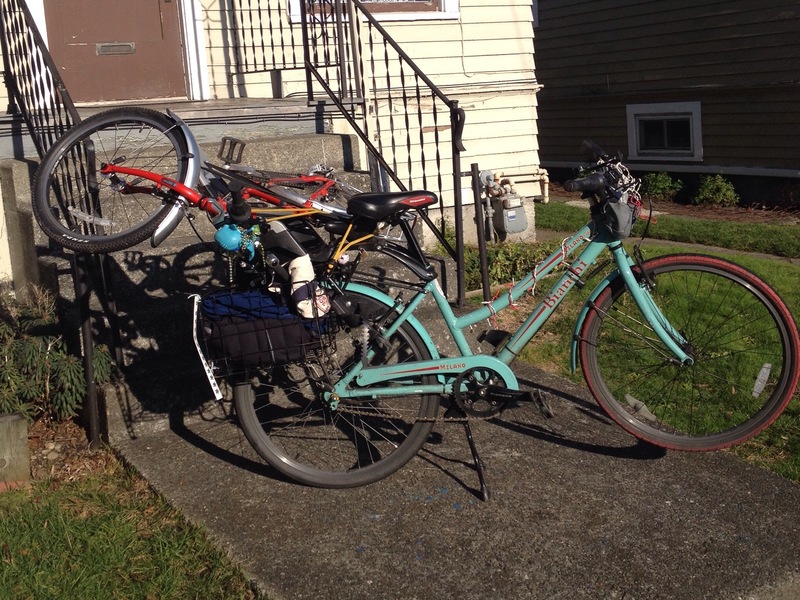 Another bonus was that my empty deck meant I could scoop up two sisters so their mom could have an easier trip up on her new Xtracycle. And since my five-year old was far out of sight by this point, he couldn’t see the interloper in his seat and insist on taking it back. 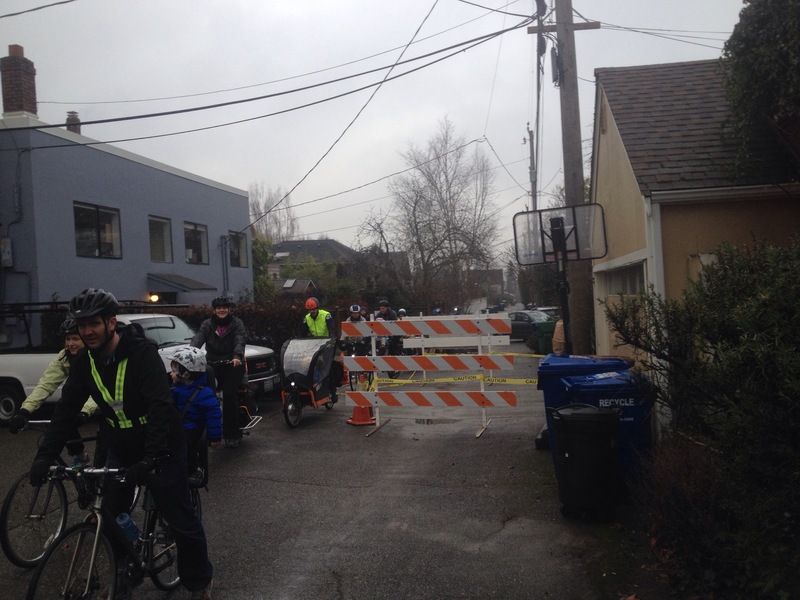 South of Interlaken, we ducked into the alley between 19th and 20th…where we encountered a ROAD CLOSED blockade. I patted the new cement and determined it dry so we picked our way through. 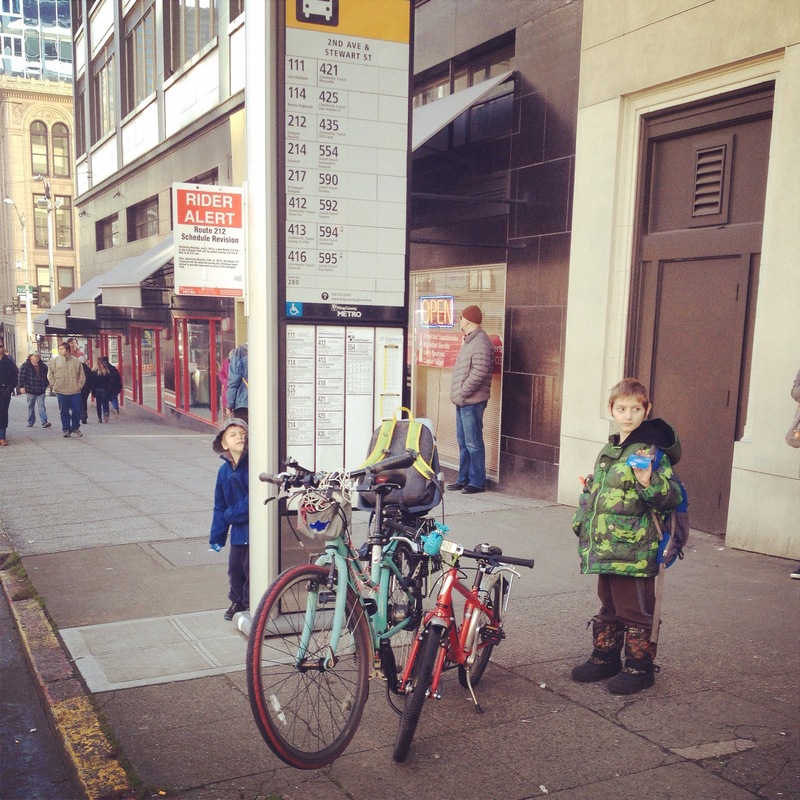 Can’t stop Kidical Mass! That’s the family that runs Spoke & Food heading through first. It’s one of our favorite events and we’ll bike to a participating restaurant on July 29th–save that date! Chuck’s was packed! I had hoped arriving near the beginning of the all-day/all-night celebration would mean we’d have the place to ourselves, but that wasn’t the case at all. I think we should repeat this ride in the summer where there’s nothing special going on. With a playground pitstop included. 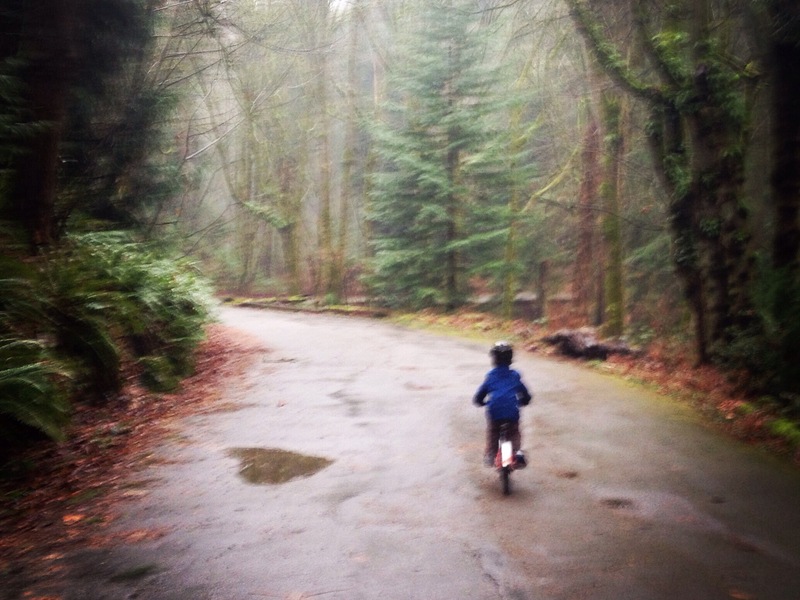 I leave you with a blurry photo of my five-year old and a heart-shaped puddle–just before he took over ride leader duties and led the fast crew through Interlaken. But first! 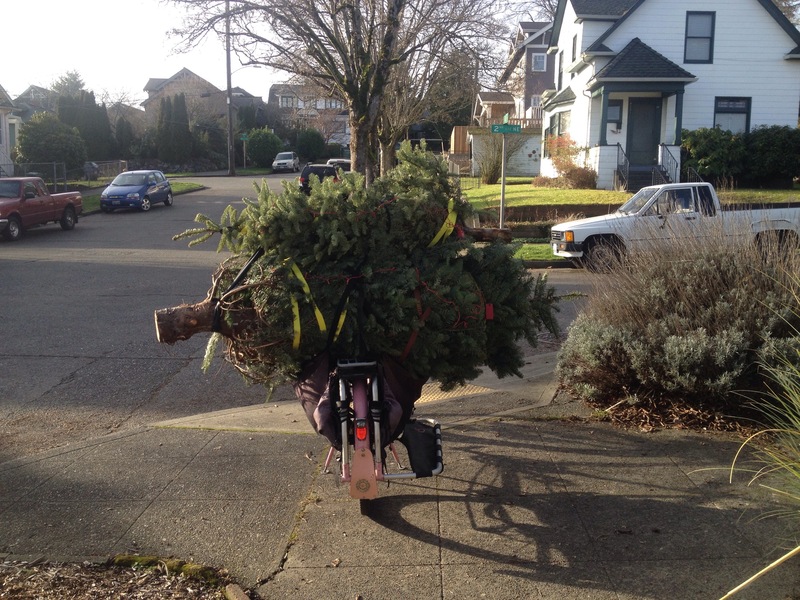 I carried our tree and the kids on December 5th so that was new (and fun!). 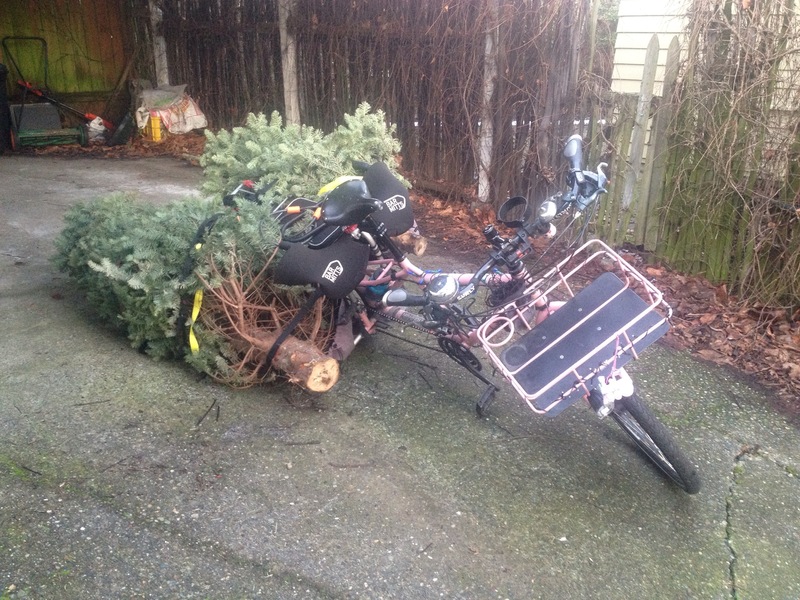 Our tree was a little on the small side, but our neighbor let me take his much bigger tree so I felt sufficiently laden…except the difference in weight meant it didn’t work with one tree in each FreeLoader pocket–the bigger tree pulled the bike over to its side. I figured it’d be too hard to ride, but I admit I didn’t even try. My next try was to put the big tree along the top of the deck, but then the little tree in the pocket pulled the bike over to that side! I tried to get the little tree vertical behind the big tree, because how cute would that have been?? But the trunk was a teeny bit too big to fit into the Yepp seat bracket so it didn’t seem stable. So I’m a little disappointed in myself for this next part because I’m more of a “hastily throw on the cargo at the last minute and hope for the best” sort, but I took a test run to check the trees’ stability. It went well! 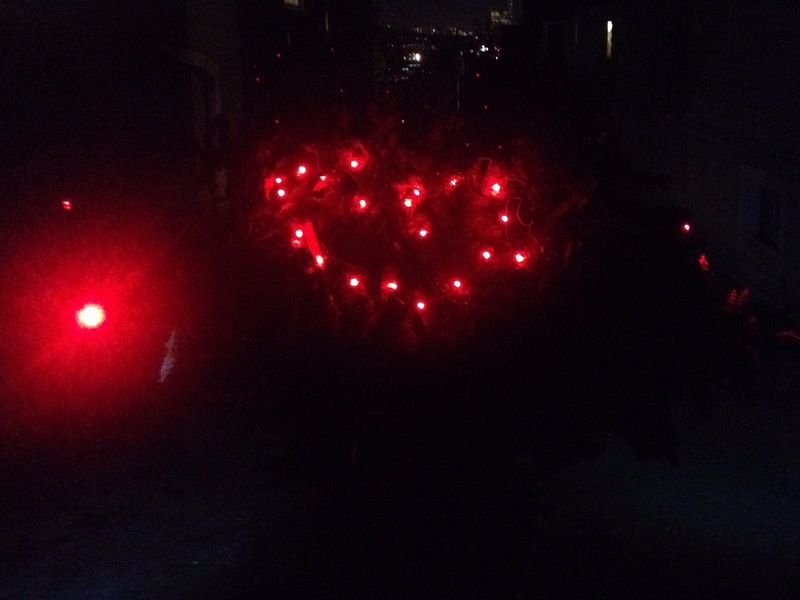 I was a bit wider than a car so I stretched rubber bands around the two trunks and attached front and rear lights to each, to mark my “wings” and I shaped my twinkle lights into a big heart, hoping that would endear me to the people stuck driving behind me. I also carefully chose my route to Westlake Park–I opted to avoid bike lanes, like the one up 34th from Stone to the Fremont Bridge since I’d stick out so much. Instead, I kept to the Burke-Gilman Trail under the bridge and circled back up and around. This was also nice since I could use the contraflow bike lane by PCC and have my own light to cross the bridge–I’d have to take the lane over the bridge so I liked that I’d have 10 seconds or so before the cars coming down Fremont Ave caught up to me. Unfortunately, I was a bit late and the ride left right on time. I thought 7:15 meant the crowd would start gathering at 7:15 and leave quite a bit later, but at 7:35, when I was a few blocks away, a women riding the other direction called to me that they’d left and I should turn around. Since I was so close I hit the park anyway and see if there were other latecomers to ride with. I hadn’t considered missing the ride and therefore hadn’t put any thought into wide-bike routing. Thankfully I found a few people bound for the ride and headed north with a dude named Doug. He had plans to bring a tree and even practiced (I’m not the only one!) with it in his messenger bag, but his neighbors sent it out with their curbside recycling while he was at work. Taking the lane over the Ballard Bridge wasn’t too bad, but would have been much more fun (and not at all scary) in a huge group. 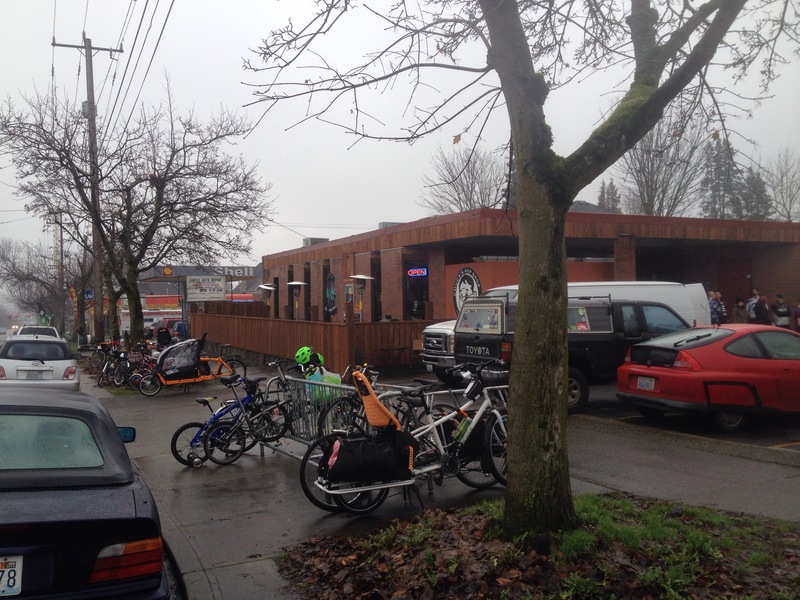 We caught up to the pack at Peddler Brewing, where they had stopped to load extra trees. So I got a bit of a group ride after all. Doug’s the treeless guy in front of me in my first video. Doug wasn’t the only treeless rider, but the majority of us were packing pine. I worked my way up through the crowd enough to get my first look at the music bike. My video doesn’t adequately capture how loud it is. The tree burning went quickly. Joby in his fire suit and Fred in a tree costume did most the flame feeding. 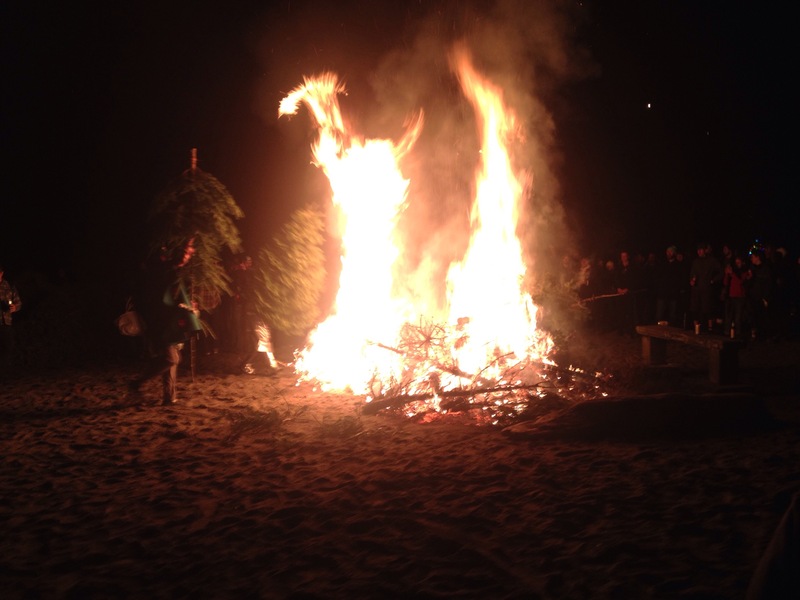 Josh Trujillo’s Christmas trees set ablaze in annual tradition slideshow for Seattlepi.com has the best photos, including the extinguishing by the fire department at the end–boo! After the early end to the evening, most everyone migrated to another park. On the way there, I happened upon a woman on her way to the beach with a tree tied to her back with her clothesline. She didn’t want to continue along with us, but happily gave me her tree. New tree! And thank goodness I had a set of kid scissors with me–which I had brought along in case I had trouble freeing my trees from my bike (which I did, I used them to chop off an old innertube holding the big tree to the deck). I felt bad destroying her clothesline, but it took five snips and she was very relieved to have it off. And then I got to throw it in the second fire myself–woo hoo! It’s an honor to be personally mentioned in both of ’em. You can pick your nose, you can’t pick your public art, but you *can* pick your public art’s nose. Not sure it’ll stick, but we’ll find some other public art to poke our fingers in and see how it smells. I love how easy it is to stop en route for quick, fun stops like this while traveling by bike. We also dinged our bells and hollered “Happy New Year!” to everyone we saw, which included two family biking families (trend!). And we made a pit stop at the lake to toss in a few rocks while shouting “Polar bear plunge!” but since Green Lake is currently overrun with toxic algae, rocks and sticks were the only things taking the plunge this New Year’s Day. Shopping was great: bought a lot, but it all fit on the bike and I got to shrug off the offer of help out to my car by letting the checker and bagger know we came by bike and were therefore able to park right outside the door. Heading home was great, too, but I lost the draw and had to hop off the bike to push the “beg button” to cross busy North 50th Street. I can usually count on my seven-year old to take care of button pushing. Ha, in both senses of the phrase. This naturally got me a bit grumpy about push-to-walk buttons in general. Here’s a nice article on Gizmodo, “Why Do Pedestrians Have to Press “Beg Buttons” to Cross the Street?”, which will hopefully make you grumpy, too, because while trendy family bikers love company out on the streets, grumpy beg-button pushers love company in their grumpiness. And then 10 blocks later we found money! Someone had tossed a dozen coins into the street so we stopped to retreive them. A buck twenty! This was a block after we left the Neighborhood Greenway and a block still from home, so a nice, quiet street. You can see a car coming down the street towards us; I was able to easily wave them around, but I’m not sure my “Woo hoo! Money in the street!” pantomiming came through. Easier to communicate things like that to people on bikes…or at least to people in cars who drive around with their windows rolled down. So that was our little trend-setting day. Heh, I did worry that many of the people we shouted New Year’s greetings to assumed we were out for a special first-day-of-the-year ride and not doing our usual thing. 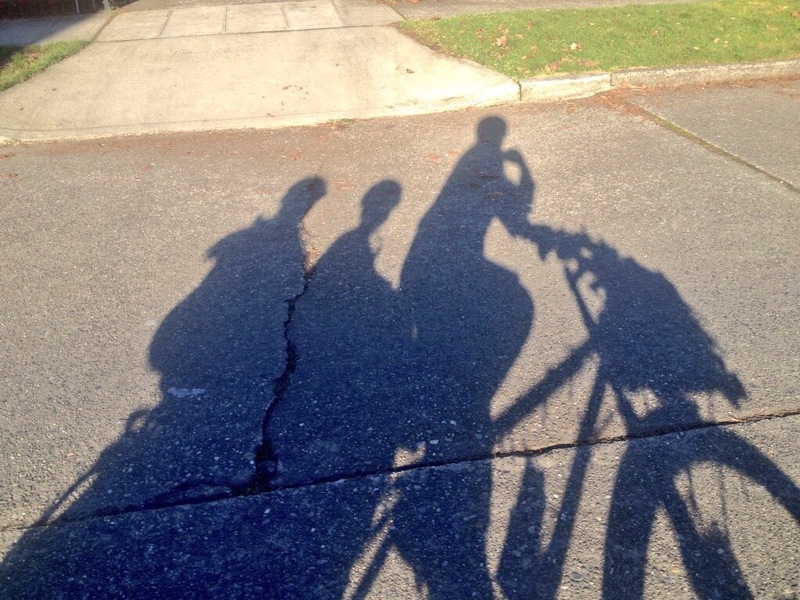 Family biking certainly is a terrific way to start the year. Followed up by family biking every day thereafter. Though having said that, no New Year’s Resolutions for me this year (or any year lately because I pretty much killed it 15 years ago when I resolved to eat every item on the Taco Bell menu over the course of the year. Shudder, still.) But lemme know if you’ve got one that’s bike related! I know of several people determined to bike every day of 2015, which I wholeheartedly support and will maybe try some year myself. 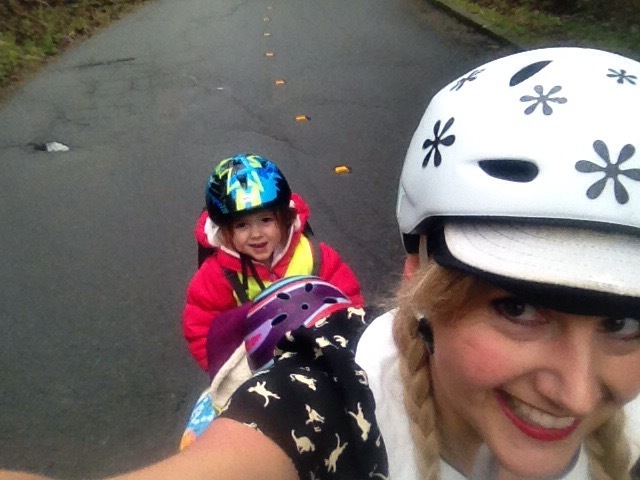 And if you want to join the trend, come on my next Kidical Mass ride! 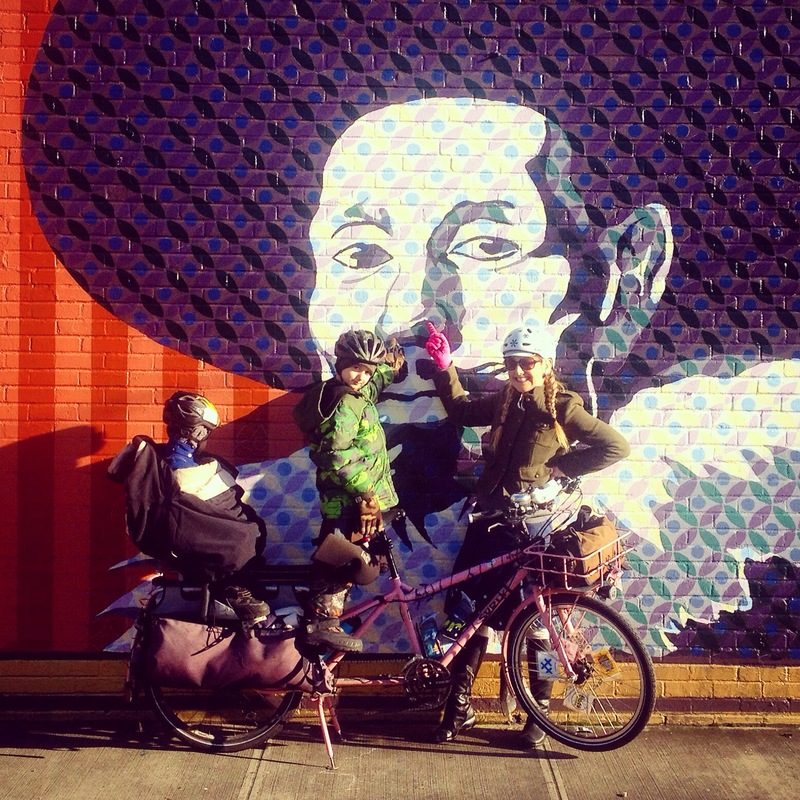 Saturday, January 10th Kidical Mass to Chuck’s Hop Shop Central District Anniversary Party. Or just come hang out at Chuck’s if that’s easier. No family bike required! We’re an inviting bunch and love to share our bikes for test rides.